Description: Flexiblesoft Dialer XP Lite adds convenience to your everyday dial-up networking. This multi-functional dialer allows you to connect to the Internet with one click from the system tray. The program will monitor your connection, and automatically redial multiple numbers if you're bumped off-line. Its skinnable toolbar-style interface displays the current time and your actual connection speed. Description: Flexiblesoft Dialer XP PRO adds convenience to your everyday dial-up networking. This multi-functional dialer allows you to connect to the Internet with one click from the system tray. The program will monitor your connection, and automatically redial multiple numbers if you're bumped off-line. Its skinnable toolbar-style interface displays the current time and your actual connection speed. Description: Modem Monitor is a program for monitoring a status and performance of the remote(or local) modem. The program is intended for using in networks, connected to Internet through phone line(modem). Allows on workstations in the network to receive the information about status and performance of the modem connection, located on other machine. Designed in client - server distributed architecture. Description: Internet Cyclone is a powerful, easy-to-use, Internet Optimizer for Windows 95, 98, ME, NT, 2000, XP, Vista, 7 and 8 designed to automatically optimize your Windows settings wich will boost your Internet connection up to 200%. Internet Cyclone is compatible with all modems and high-speed LAN, ISDN, CABLE, DSL, T1 or other connections. This software will still be useful to you after upgrading your connection. 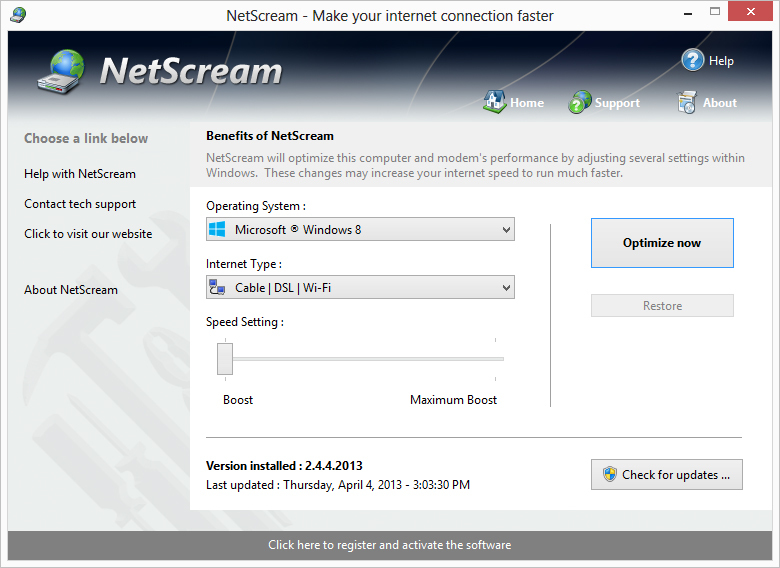 Description: NetScream is a tool for all that allows you to modify your modem settings to increase internet performance up to 200 percent!! No modifications to your hardware are made and all adjustments and settings are done in an easy to use interface that a child could use. Most other modem enhancers promise that they work while you notice no difference at all in internet speed. Description: The PC Fax Receiver is a program that allows you to receive faxes with your PC and 56K modem. With this software you can set the number of rings before answering the fax call, save the fax documenet as a tiff file, set the phone line device, and much more. The PC Fax Receiver support many fax fetures, such as: fax class, fax encoding, baud, speaker mode, speaker volume, init the device with AT command string, and more and more. Description: This freeware program allows you to send faxes from your PC and 56K modem. The PC Fax Sender allows you to send a tiff (fax capability) file to a list of fax numbers, one by one and automatically! just set the phone numbers you want to send your fax and the program will send it to any one from the list. Also, you can set the phone line device, and much more. Description: When you need to read a fabulous magazine, but you do not want to bring the book with you, you can use the PDF to Flash Magazine for html5 to convert the magazine into [url=http://www.page-flipping.com/] flipping book [/url] so that you can view the flipping book with a link if you have uploaded it. Besides, the flipping book can be output in zip or exe format that allows you send to others via email. Description: You are in the Internet now, but are you sure, that you will not receive a several thousands dollars bill for the internet service? Answer "Yes" means that either you are unconcerned or you have got our program. If your response is "No", that this program is especially for you. It allows controlling a modem connection and prohibiting unauthorized connection attempts on chargeable phone services. Plus cool trojan scanner!! !